These are my candid musings on my passion for motorcycles, especially riding my new Honda CTX700nd. I loved my Piaggio MP3 500 but I had to sell it to make room in my garage. Just enjoyed our 25th wedding anniversary by celebrating in London and Paris. Traffic was incredible in both cities and with the cost of petrol at over $8 per gallon in London, it is not surprising that motorcycles and scooters were everywhere. 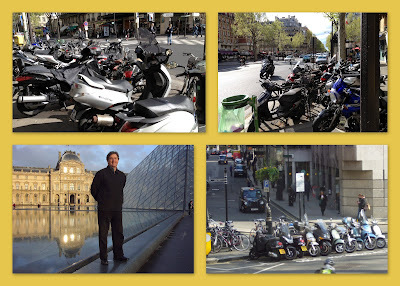 There wasn't a corner in London or Paris that didn't have scores of parked bikes. Not only small Vespas and Chinese scooters but sport bikes and Harleys. It seemed that almost 1 in 5 were Piaggio MP3s but I never once saw my particular model, the MP3 500 (in Europe it's called the Gilera Fuoco 500ie). I like riding my bike, but the traffic there was crazy! I'll wait to get back to my quiet country rides. Copyright (C) 2011 Rodney B. Murray. Travel theme. Powered by Blogger.